The Candlelight Processional is performed three times each evening at at 5, 6:45, and 8:15 PM at the America Gardens Theater in the American Adventure Pavilion. Dining packages are available for the performances. 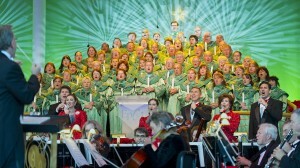 This year the Candlelight Processional will be performed from November 22 through December 30. It is included in your admission to Epcot.